What’s Your Psychology Of Money? The structure of your thoughts and your daily communication along with your corresponding actions creates a huge difference in your outcome. Your projected thoughts and words are directly related to your financial result. Therefore, we must shift the use of negative language otherwise it creates a handicap. Negative words whether projected in our thoughts or dialect as: “I cannot, I don’t have” clearly create blocks to achieving financial wealth. We all know about the ‘Law of Attraction’, the more we focus on any one thought, the more we attract that stream of consciousness. If your thoughts are misaligned with what you want to achieve then a course correction is an absolute necessity. Such choice words, as “I can, I am”, and “it is doable” project self-assurance, confidence and faith, and acknowledges to the Universe that you mean business. Remember it may take time to create consistency. Finally, you must follow up with actions. 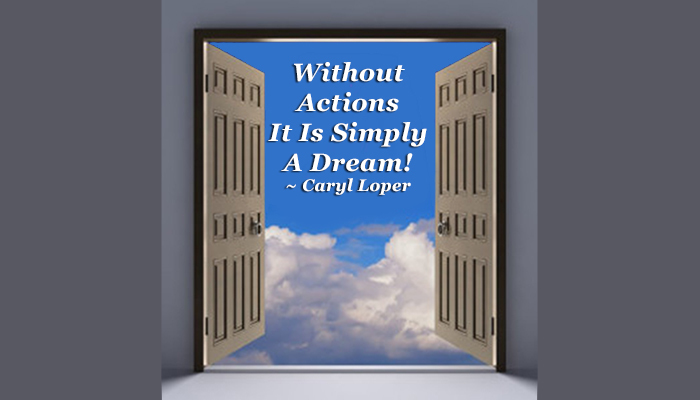 Without actions it is simply a dream! Recently I remembered an incident when I was the young age of nine. I was extremely diligent in saving money in my bank account. At one point, after retrieving my bank statement book I noticed that my credit column stated I had a million dollars. It took quite a while for my Dad to explain that the bank teller was ‘slap happy’, zealous with her zeros, and that I had a hundred dollars in my account. For many years I carried that passport book around with me. I believe the Universe with clear precision was telling me that I have money waiting for me in Escrow. If your thoughts and words are in misalignment then it will have a strong repercussion on your life. It will translate into a powerful manifestation, perhaps not the one you set your intentions on. In reality if I say I want four thousand dollars to manifest in thirty days, but I am secretly saying, “I am not worthy of that lifestyle”, or “I doubt that I will receive it” then you will manifest what you think. Holding onto the same patterns, the same internalized paradigm that does not function will give you the same outcome. If that model is diluting your outcome then it is time to let go of learned principles and behaviors, and create a new system. Lastly, although the movie, The Secret initiated the means to create balance within your life, it had many gaps. Its mindfulness on how to solidify financial bliss was ambiguous. That model will work effectively only once you institute actions. The missing integral to that whole vision is follow through. Action places your thoughts and words into a ripple effect. The key is consistency with your thoughts, words and actions. Are you consistently manifesting what you want?? ?